Hey Y’All! I am Chuck Ivins. I have been in the floral design business basically my entire life. I was born and raised in Farmington, Delaware a little farming community a few miles south of Harrington, Delaware. Even though I am small hometown person, my style is big as Texas and faster than New York City. I was blessed with a God given talent of making beautiful things out of flowers. After many years of working in the floral business, I opened Ivins Florist in my home. This business has blossomed from my beginning designs being created on my kitchen table to a retail store with employees. I never dreamed I would ever be so successful. I have a fun loving spirt. I never meet a stranger. I have a true love for people. My heart celebrates with them as they celebrate two lives joining together on their wedding day or cries with them when they have to burry a loved one. I enjoy listening to their personal stories as we are designing their wedding or choosing the perfect arrangement for their loved ones funeral. I believe everyone has a story and each arrangement should tell that story. I take pride in making each person’s wedding or funeral unique. Everything I do and create is because it’s from my heart. I put my love and passion into everything I do. I have been deeply involved in my community and state serving on many boards and committees. I was born and raised in the community I live. I have attended the same church for most of my life. My business is attached to my childhood home. I attended Lake Forest School District. I graduated from Wilmington University with a bachelor’s degree, and master’s degree in special education. I have spent my life educating students with special needs in the public school s in Delaware. 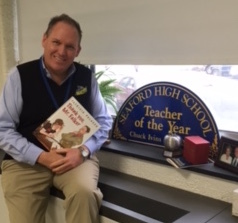 In 2015-20I6 I was awarded “Teacher of the Year”. I had the opportunity to work as an administrative assistant for a former Governor of the state of Delaware. One of my greatest joys was decorating the Governor’s Mansion with my floral designs. I have created beautiful master pieces for our state and national legislators. I have had the opportunity to do flowers for the Vice President of the United States. Doing flowers for our local funeral directors Mr. and Mrs. Carpenter has built a great friendship with Lofland-Mcknatt Funeral Home. I work as associate for the funeral home. I am continuing my education in mortuary science to become a licensed funeral director. I believe we are all life-long learners. With hard work and determination you can be anything you want to be. I had a dream and have been blessed to see my dream come true in my florist business. I thank God each and every day for my talent. He has truly blessed me. My parents Charles and Madeline Ivins Sr. always believed in me and supported my visions and helped me to make them to become reality. I give much credit to my mother who passed away in 2011 to helping me mold into the person I am today. She taught me core values to respect my fellow man kind, fear God, and love people. As a child I was raised in the Delaware 4-H program. My 4-H leader Mrs. Ruth Ann Messick believed in me, and taught me to share my talent in my club, my community, & my world. She helped mold me into the person I am today.